AAR Japan’s emergency response team is continuing relief activities in Mabicho, Kurashiki City, Okayama Prefecture, which suffered extensive damage. 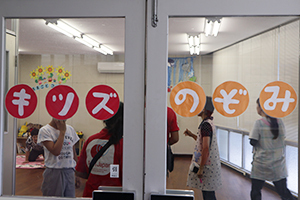 On July 23rd, AAR Japan visited “Nozomi Kids Station”, which provides after-school day care services for children with disabilities. 11 children with disabilities, ranging from elementary to high school age, had been using their services, but the recent flood had completely destroyed the facility. Their five shuttle cars were also submerged in the flood waters. The manager, Ms. Tomoko KAWAKAMI, gave up on resuming services in the same location and decided to relocate to the neighboring Soja City. However, the new 130 square meter space only had an air conditioning unit made for a 13 square meter space. In this hot and muggy room, the children were playing with the stuffed animal toys that the staff had managed to acquire. 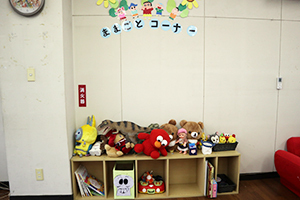 In an effort to make the new space more enjoyable for the children, whose living conditions have become less certain, AAR Japan provided toys, two fans, and storage items, such as a shoe rack. The children were very happy and quickly started playing with the new toys. Watching them play lifted our spirits. At the Kurashiki Public Nima Elementary School evacuation center, AAR Japan is working with the non-profit organization Peace Project, helping to run soup kitchens. There is now fresh running water in the evacuation center, which had previously been turbid, so bottled water had been used in the soup kitchen. On the night of July 23th, 2018, AAR Japan provided 250 meals including rice, miso-simmered mackerel, and hijiki seaweed. 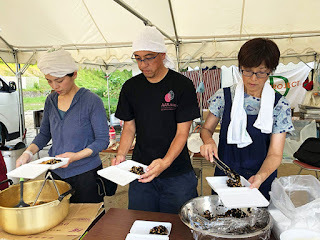 The line started at 5:40pm and continued to around 7pm, and there were people who came up to us to thank us, saying: “This was my first time eating fish and prepared dishes since the disaster. It was very good! The children were happily eating and kept saying how delicious it was.” Listening to them lifted our spirits. 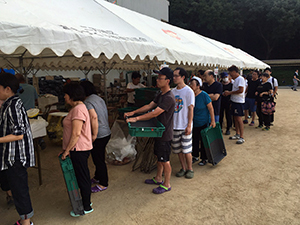 On July 24th, 250 meals were provided. For lunch, there was yakisoba, and for dinner there was seafood curry, cucumber seaweed daikon sunomono salad, and miso-simmered daikon. The sunomono salad was added at the last minute, after we received a request from one of the victims. The ice-chilled sunomono salad was very well received. 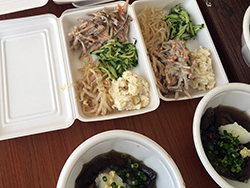 On July 25th, 250 meals of nebaneba rice bowl and fish soup were served for lunch. 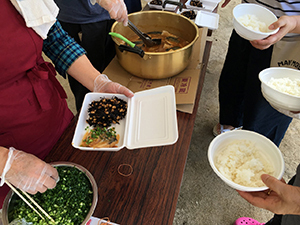 For dinner, dinner, there was curry rice provided by Curry House CoCo Ichiban, so AAR Japan provided 70 portions of rice that were needed, as well as sides of eggplant, potato salad, burdock salad, bean sprout namul, and cucumber – enough for 300 meals. We made an effort to provide many sides, centered around vegetables, as there have been less of these available. A man in his twenties, who volunteered both during the day and in the evening said: “My house was flooded up to my knees on the 2nd floor, so up until yesterday, I was cleaning up my house. I’m currently staying at a friend’s place. My friends all say that Mabi is the back-country, but I love that about Mabi, there is an understanding between neighbors, and it is an easy-going place. I am very happy that people have come from afar to run a soup kitchen. That is why I volunteered this weekend and will be here again next weekend. 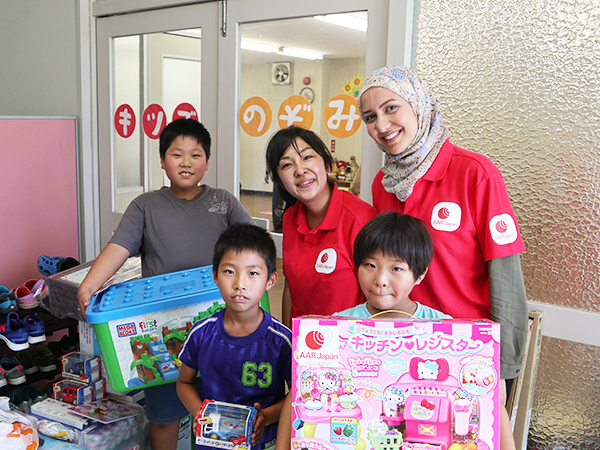 AAR Japan will continue to provide aid in the affected areas. 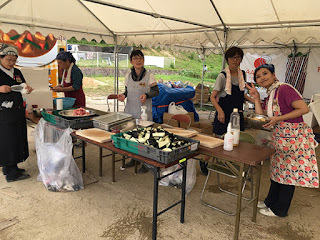 In addition to everyone’s donations, these efforts were supported by JPF, who supported the survey activities, and Mercy Relief, with whom we are running the soup kitchen. People were exhausted after scraping out the mud from their flood damaged houses, but looked recovered after having meal. Please write down “Western Japan” and specify if you need a receipt.